Seigler, 19, grew up outside Atlanta in Cartersville, Georgia, and his father named him after former big leaguer and longtime friend Tony Phillips. As a senior at Cartersville High School last spring, Seigler hit .421 with 13 home runs while posting a 1.90 ERA with 29 strikeouts and six walks in 25.2 innings. Prior to the 2018 draft Keith Law (subs. req’d) ranked Seigler as the 25th best prospect in the class. Baseball America (subs. req’d) ranked him 41st and MLB.com ranked him 46th, though mock drafts consistently put Seigler in the back half of the first round. The Yankees selected Seigler with their first round pick, the 23rd overall selection. He was at the MLB Network studios for the draft broadcast. Pretty cool. Seigler was committed to the University of Florida but there were never questions about his desire to turn pro. “There’s no doubt in my mind that I’m definitely going to sign with the Yankees. This is a no-brainer for me,” he said the night of the draft. Five days later, the Yankees signed him to a straight slot $2,815,900 bonus. Seigler played 12 games with the rookie Gulf Coast League Yankees and another 12 games with the rookie Pulaski Yankees after signing. He hit .266/.379/.342 (108 wRC+) with one home run and more walks (14) than strikeouts (12) in his 24 games. A hamstring issue sidelined him for two weeks in July and his season ended a week early after he took a foul tip to the face mask and suffered a concussion. Seigler was healthy enough to be a full participant in Instructional League after the season. Widely considered the most defensively advanced high school catcher in the 2018 draft class, Seigler is build solidly at 6-foot-0 and 200 lbs., and he’s a very good athlete who should have no trouble moving to third base or the outfield should the catching thing not work out. That said, Seigler is considered a no-doubt long-term catcher because he receives well — he caught all those big velocity low level arms the Yankees have with no trouble in his pro debut — moves well behind the plate, and has a good arm. In fact, Seigler has two good arms. He’s an ambidextrous thrower a la Pat Venditte. Seigler pitched with both arms as an amateur. From the right side, he sits in the low-90s and features a slider. He’s a bit more crafty from the left side, working in the mid-to-upper-80s and lulling hitters to sleep with a changeup. The Yankees intend to keep Seigler behind the plate. It wouldn’t be fair to call him a novelty act on the mound — Seigler would’ve been a two-way player with the Gators — but he wasn’t much of a pro prospect as a pitcher. Catcher was always his long-term home.
? Seigler is more of a “he does everything well but nothing exceptionally” guy rather than “wow look at that standout tool” guy. He’s well-rounded and he projects to remain at the hardest position to fill in the sport. Seigler also draws rave reviews for his makeup and work ethic — “(He’s) consistently referred to as one of the toughest players in the prep class,” said Baseball America’s pre-draft scouting report — and he even asked for a Spanish-speaking roommate this summer so he could work on learning the language. Pretty cool. Catchers, especially high school catchers, tend to be moved slowly early in their careers because there’s so much to learn defensively. Over the last few years nearly every high school catcher drafted in the first three rounds started his first full professional season in Extended Spring Training before joining a short season league in June. Seigler might be one of the exceptions. He’s advanced enough offensively and defensively that the Yankees could send him right to Low-A Charleston to begin next season. We’ll see. Either way, ExST or Charleston, I don’t expect Seigler to play above Low-A in 2019. High school catchers generally aren’t the fastest risers, you know? Switch-hitting catchers are my jam and I love Seigler. He is pretty much everything the modern front office looks for in a player. He’s athletic, he has two-way ability, high-end baseball smarts, and he’s tough as nails. I don’t know whether the Yankees would do it, but a team like the Dodgers or Rays might have Seigler play some outfield in addition to catcher, just to increase his versatility and make him more flexible in the three-man bench era. The Yankees are very good at developing catchers (Francisco Cervelli, Kyle Higashioka, John Ryan Murphy, Austin Romine, Gary Sanchez, etc.) so Seigler is in good hands. That doesn’t mean he’s guaranteed to work out. But I feel pretty good about the chances of a kid with this skill set under this development staff turning into a big leaguer. 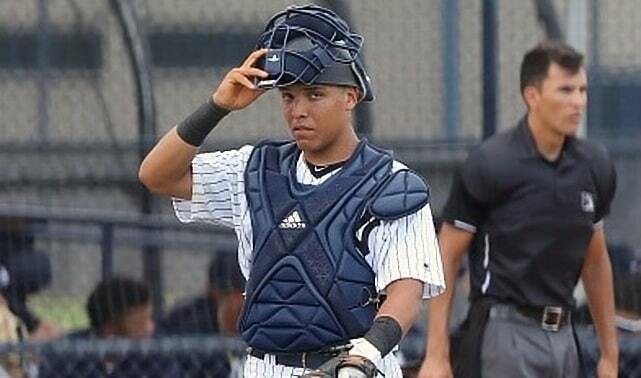 With Justus Sheffield poised to graduate to the big leagues next season, Seigler is the early favorite to be the Yankees’ top prospect at this time next year.